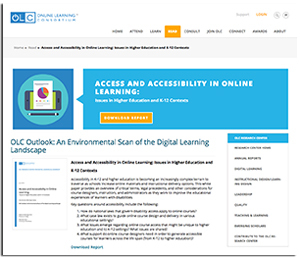 The Online Learning Consortium (OLC) has introduced a series of reports to keep people in education up-to-date on the latest developments in the field of digital learning. The first report covers accessibility and addresses both K-12 and higher education. The series is being produced by OLC's Research Center for Digital Learning & Leadership.